So you’ve got a G19 keyboard with 3 sets of 10 macro keys and a mouse with 15 (or more) buttons. 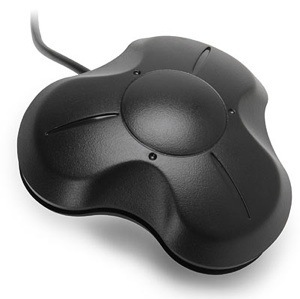 That will allow you to take any one of dozens of actions instantaneously with twitch of your hand. But you need more. Well, what are you doing with your feet right now? Probably not pressing buttons. Can you smell what I’m cooking here? 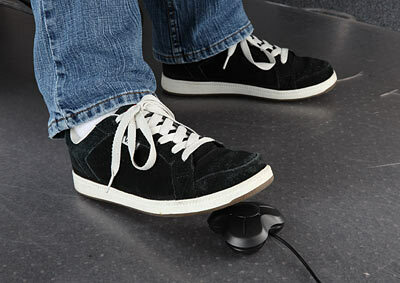 The StealthSwitch II is a button for you to step on. That’s it. It can be assigned to a keystroke or macro, and… it goes when you put your foot on it. Now, I have to say I’m a little disappointed by this thing. You’re trying to add a whole new dimension of interactivity with a computer, and you give the thing one button? A foot can do more than stop, guys. Why not hair triggers on the left and right so we could assign them to lean directions? In fact, that’d be pretty awesome. But no, it’s just one button. Sure, you can daisy chain them and stuff, but there’s a lot of potential for a truly custom device here. For $15-$30, though, you can’t expect miracles. I appreciate the idea, but come back when you’ve done more than execute it perfunctorily.